Everybody can be cursing space monkeys! During a developer livestream last week, Ubisoft Montpellier showed off more of Beyond Good and Evil 2, perhaps one of the most anticipated video game sequels ever. While the reveal of the title itself was a big surprise during last year's E3, we here at Co-Optimus got a nice surprise during that livestream when the devs (finally) discussed the co-op gameplay... sort of. It's worth noting upfront that there's a lot of speculation with the co-op elements for the game. The Verge article from last June that first revealed there would be co-op in the title didn't have much else to say at that point. Likewise, the stream and gameplay video weren't exactly forthcoming with all the juicy details we are eager to know, but there are a couple things we gleaned. Players will all create their own space pirate and be part of a crew on ship. It's not spelled out if that crew is all A.I., or if it's a mix of A.I. and human. However, regardless if you and your buddies are all part of the same in-game crew or not, you can all group up to form an armada and go flying about together. The dev team is striving to have a real seamless experience here so that players can freely move from running around on the ground of a planet, to flying around the sky, to then going into space and off to a different world. It's very ambitious to do that for just one player, much less a whole group, so as the dev team admitted during their livestream, that's a large part of why the development has taken so long. While the first half of the video above focuses on the movement and combat systems, the second half briefly dips into a discussion of co-op. When that transition hits (right around 1:22 mark), 8 player ships are shown on-screen. The game may end up supporting more or less, but we'll take it as an initial number for how many simultaneous players can be space pirates together. 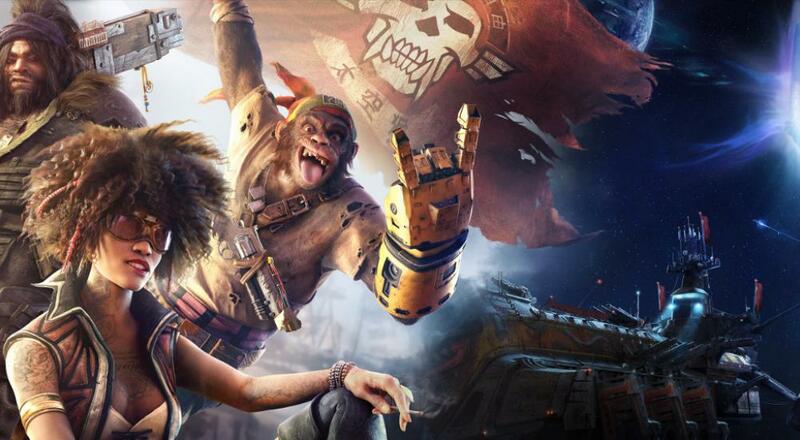 There will be more details revealed during this year's E3, and we can't wait to see what Ubisoft has in store for Beyond Good and Evil 2. Page created in 2.3360 seconds.